Last Tuesday night, Australia’s fourth X Factor winner was crowned. 24 hours later, Samantha Jade’s coronation song “What You’ve Done to Me” topped the iTunes’ list. 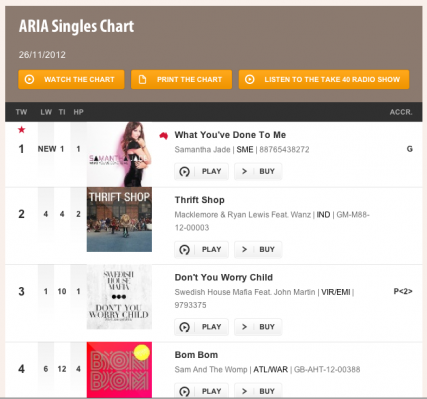 Today, six days later, Jade hit the ARIA Singles Chart at #1. And by selling more than 70,000 singles in the past five days, it also has gone platinum. The song is written by Jörgen and the Australian songwriters David Musumeci, Anthony Egizii and Tania Doko. Samantha Jade’s self-titled debut album is released on December 7. It includes Jade’s cover of Kelly Clarkson’s Billboard Hot 100 #1 song “Stronger (What Doesn’t Kill You)”, also co-written by Jörgen.